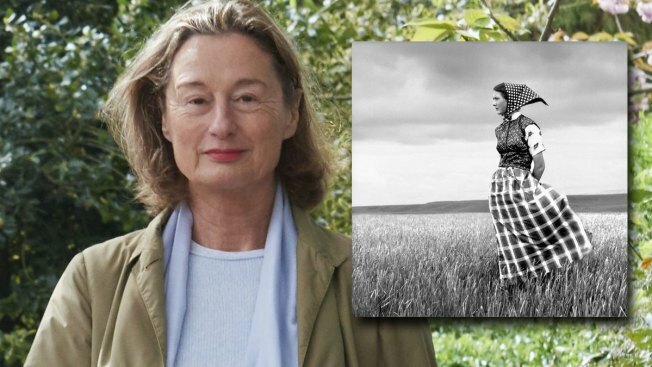 Laura Wilson, photographed by Andrew Mitchell. Wilson's Hutterite Girl in Field is inset. Dallas photographer Laura Wilson's images of the American West are featured in a new exhibit at a Fort Worth museum. The exhibit titled "That Day: Laura Wilson" opened Saturday at the Amon Carter Museum of American Art. The exhibit featuring more than 70 of her photographs runs through Feb. 14. 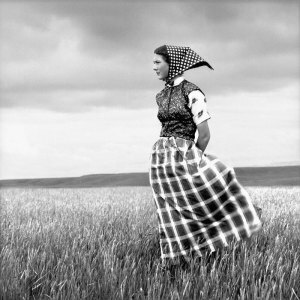 Hutterite Girl in Field, Duncan Ranch Colony, Harlowton, Montana, June 17, 1994 Gelatin silver print. (Click on the image to see a larger size). The subjects of Wilson's photographs include: American Indian communities in South Dakota; debutantes in Laredo, Texas; Hutterite communities in Montana; people along the U.S.-Mexico border; and six-man football teams across Texas. Wilson, who worked with photographer Richard Avedon on his project photographing the American West, is the mother of actors Andrew, Owen and Luke Wilson. Her work has appeared in publications including The New York Times Magazine and she is the author of four books.